Finally! My first WordPress Theme release! Loosely based on this blog’s theme, I began work on it last September, but for some unforeseen reasons (actually I don’t remember — is unmemorable a word? ), I abandoned it. Last night, lightning struck and I finally decided to finish it. Oh, I also ended up renaming it. I’m launching this theme in tandem with my new gadgets blog. 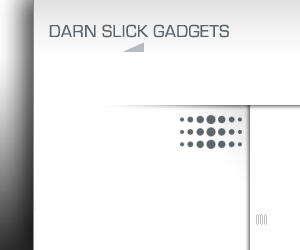 Head over to the official theme page at Darn Slick to check it out. May I know, kung ano ang gamit mong server/platform? @Magnumbash: How is that relevant to the topic? Cheers for the template – really good. Only 1 thing that I’m not keen on, not sure if it’s the multiple tags at the end, but the bottom of the page doesn’t end after the final bits of text – any chance you could take a look at that?